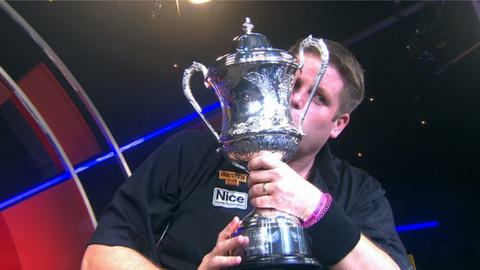 Scott Mitchell claimed his first BDO world title with a thrilling 7-6 win over three-time winner Martin Adams at the Lakeside. A tense final was finely poised throughout, with both players struggling to hold their throw and neither able to forge a two-set advantage. Englishman Mitchell, a 44-year-old landscape gardener from the New Forest, won £100,000 in prize money, part of which he plans to spend on a new tractor for his family's farm. Lincolnshire-based Adams, 58, was hoping to extend his record as the oldest world champion in the sport's history. He went into the 38th BDO World Championship final - the 30th to be played at the Lakeside - with vastly more experience of the big occasion compared to Mitchell, who had never been beyond the last 16 in five previous visits to Frimley Green. Making his 22nd consecutive World Championship appearance and playing in his fifth final, Adams hit two maximums in the first leg of the match but was less proficient with his finishing, allowing Mitchell to break the throw twice and clinch the opening set. Adams, who failed with his first 12 shots at a double, won six of the next eight legs to go 2-1 in front. But he was thankful that Mitchell, in attempting a 123 checkout for the third set, bust his score when his effort at double nine strayed into double 12. The next three sets went with the darts, but the remaining seven went against the throw. Mitchell missed four darts to go 5-3 ahead and Adams, involved in an epic semi-final with Glen Durrant 24 hours earlier, landed double top to level at 4-4. Mitchell punched the air in delight - his first visible emotion on stage all week - as he fought back from two legs down in the ninth. Two more breaks put fourth seed Mitchell within a set of victory and, after he had missed a dart at double 16 for the match, a 91 checkout from Adams forced a final set. Helped by a brilliant checkout of 158 in the first leg of the decider, Mitchell went two legs up and the tears flowed after he hit double top to seal a memorable victory.